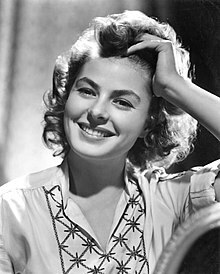 Ingrid Bergman (29 August 1915 – 29 August 1982) wis a Swadish actress who starred in a variety o European an American films. She wan three Academy Awards, twa Emmy Awairds, fower Gowden Globe Awairds an the Tony Awaird for Best Actress. She is ranked as the fowerth greatest female starn o American cinema o aw time bi the American Film Institute. She is best remembered for her roles as Ilsa Lund in Casablanca (1942), a Warld War II drama co-starrin Humphrey Bogart, an as Alicia Huberman in Notorious (1946), an Alfred Hitchcock thriller co-starrin Cary Grant. ↑ Obituary Variety, 1 September 1982. ↑ "AFI's 100 Years...100 Stars". American Film Institute. Archived frae the oreeginal on 2006-10-20. Retrieved 2006-10-23. This page wis last eeditit on 8 Dizember 2018, at 19:07.